A garden should be cozy and inviting, a place where the inebriating and aphrodisiac fragrance of flowers should surround you. Contributing to the décor, well-placed garden statues can enhance the beauty of your outdoor space and create a magical, almost surreal atmosphere. However, choosing the right garden statues might be a daunting task. Personal taste matters but you should also consider the overall design of the space before investing in them. In the following article, you will discover how to choose garden statues and how to place them in the garden. Then, have a look at our 10 garden statues ideas to find some inspiration! A quality garden statue is usually carved by hand and it can be made of different materials. But as you can imagine, the price will vary depending on how the statue is manufactured and on the type of materials used. Marble: these are the finest and most beautiful garden statues. Their beauty will remain unaltered over time and these pieces of décor will always be impressive and elegant. The most widely used type of marble is the white one and it stands out in gardens characterized by lush green vegetation. Since marble is a very valuable material, the cost of such a statue is usually high, depending on the size. Bronze: similar to marble, bronze is considered a noble material and bronze garden statues are suitable for decorating a classic space. Thanks to the resistance of the material, these statues are durable and their beauty can last for a really long time. Even in this case the statues are not exactly cheap but their quality is unmatched. Aged Terracotta: less expensive yet stylish garden statues are those made of aged terracotta. The reddish color of these decorative elements pairs well with the furnishings of a rustic garden and with a colorful landscape achieved with various perennials. Aged terracotta statues are also perfect to decorate a vegetable garden. The material is perfect for the creation of small decorative pieces. Aged Cement: with a typical gray color, aged cement is less precious than marble or bronze. This characteristic is reflected in its rather low price yet the material is very durable and it withstands all weather elements for a really long time. Aged cement is usually used for industrial garden statues yet they will still add value to your property. Resin: an inexpensive alternative is to choose garden statues made of resin. This material is cheap, durable, and it looks good in almost all contexts. Resin statues are perfect if you like to change the décor of your garden often. Moreover, resin statues usually come in a wide variety of shapes and colors. Depending on the type of your garden, you can place the statues among ornamental plants, next to tall trees, or hidden between lush flowers and shrubs. Before deciding which statue is the best for your garden, analyze the landscape and decide what is the best place for this type of décor. The compositions of lush vegetation, green shrubs, and tall grasses pair perfectly with white marble statues. The wavy contours of marble usually integrate well with “flowing” plants. White marble is also a good choice if you have a garden characterized by colorful flowerbeds. Aged terracotta is a perfect choice for rustic environments and aged cement pairs perfectly with a shabby chic design. Bronze statues are perfect for an elegant garden. To integrate the statues in the décor, choose the angles on which you want to draw attention. For example, in a Japanese garden, you could place a few statues around a small fountain or along a garden river or pond. You can dive deep into an uncontaminated nature by placing a small garden bench in a corner. Frame the bench with a few concrete or cement statues to enhance the curb appeal of the property. For a fairytale atmosphere, select a few small statues of fairies, animals, and other fantastic characters and place them among the vegetation of the flower beds. Animals such as snails or peacocks are also perfect to decorate the vegetable garden or a square foot garden bed. In fact, if you love animals, you can choose from a wide range of possibilities. You can opt for all types of birds, domestic creatures, or even wild animals. These statues fit perfectly into the natural fauna and flora of a garden. To enhance a rustic environment, choose terracotta gnomes or dwarfs. These small figures make the environment fascinating and are especially appreciated by children. We know that finding the right inspiration is not always easy. This is why we’ve put up a selection of 10 garden statues that might fit perfectly in your décor. If you like both animals and gnomes, and if you have a nonconformist garden, this Mischievous Cat Massacre Garden Gnome Statue will certainly make your outdoor space stand out. This garden statue pairs perfectly with shabby chic or rustic gardens and the gnome-eating cat can be placed anywhere among colorful flowers or delicious veggies. The statue is handmade from high-quality resin and it is perfect for both outdoor and indoor gardens. The statue is hand painted in vibrant colors. The tiger stripes on the cat and the burst of colors on the gnomes will make this decoration the centerpiece of your yard. Moreover, the size is perfect for many locations. The statue will most likely be noticed regardless of where you place it, yet it is small enough to fit on a bookshelf as well. Angel garden statues are among the most popular. This type of statues is preferred by those who have classic or elegant gardens and, besides cuteness, angels also give a sense of peace and meditation to any environment. There are numerous models of angle garden statues you can choose from, but if you want to combine the beauty of an angel with the convenience of a solar garden light, you could consider this solar powered Angel with Dove statue by Moonrays. The statue is really beautiful and it is made of polyresin. Imitating stone sculptures, this statue is hand painted with high-quality varnishes that keep their characteristics over time. 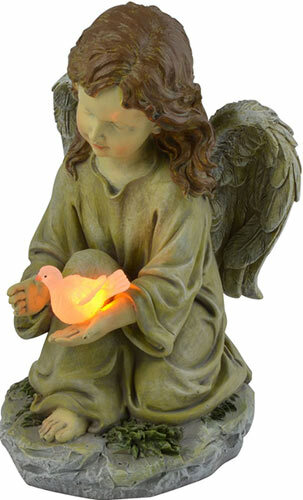 The white dove held by the angel is actually a nightlight powered by a battery that uses solar energy to recharge. Providing up to eight hours of light, the statue is perfect for memorials or to add some light to your flower garden. Small yet noticeable, the statue has a height of 9 inches and it fits perfectly even in the smallest spaces. Another great garden statue idea, perfect for a traditional or rustic garden, is to decorate your flowerbeds, patio, or raised bed with a Snail Garden Décor. Made of high-grade durable resin and hand painted in lively colors, this snail will make your garden stand out thanks to its charming smile. Moreover, this decoration is perfect to set the mood at parties or social events, thanks to the soft light integrated into the item. In fact, this garden statue doubles as a garden light. Equipped with a 2V 40mA solar panel, the statue provides perpetual light. The battery charges during the day and the LED light is automatically turned on at twilight, providing up to 10 hours of continuous light. To prevent the colors from fading away and to protect the statue from weather elements, the manufacturer coated it with a waterproof and sun resistant coating. Matching perfectly with other decorative elements, this original garden statue will certainly make the difference. Garden statues inspired by spirituality are highly popular among homeowners. Those made of stone are even more popular yet rather expensive. Nevertheless, if you’re looking for a less expensive alternative, you could consider this St. Francis Bird Feeder Statue by Bits and Pieces. The statue is made of durable polyresin and painted in gray. The distressed finish imitates stone and the look is made to last indefinitely outdoors. A great characteristic of this beautiful garden statue is the bird feeder bowl. In fact, you will be able to attract dozens of colorful birds and even small furry friends to your garden. Moreover, you will be able to keep birds away from your vegetable seedlings in spring. The statue is 26 inches high and it can be placed anywhere in the garden. For a flawless effect, it is recommended to place it among tall trees and shrubs, or near a stone wall. Finding the perfect decorations for a Japanese or Zen garden is far from easy. To create a flawless atmosphere, you will have to carefully select all elements, including the perfect garden statues. Statues inspired by Asiatic culture and art are often the first choice. Nevertheless, if you want an original garden designed to stand out, you could use alternative garden statues, such as this Good Luck Elephant designed by Grasslands Road. The statue is made of cement and resin. The dark gray finish resembles aged stone, while the linear design matches perfectly with other garden statues inspired by the Asiatic culture. Thanks to the rather reduced dimension, the statue is perfect to decorate both an outdoor and an indoor garden. Moreover, since an elephant with the trunk positioned upwards means good luck, the statue can also make a perfect gift for an enthusiast gardener or landscaper. The statue is made to resist to all weather elements and the high quality of the materials used guarantees that it will last over time. Similar to the Mischievous Cat statue, this naughty Garden Elf is another statue perfect to decorate a nonconformist garden. Colorful and joyous, this elf caught with his pants down will certainly become your kid’s favorite, not to mention that it will bring a bit of originality in your space. The statue is made of durable polyresin and it is hand painted in vibrant colors. Moreover, to make sure it will last over time, the statue is coated with a water and sun resistant coating. Thanks to the innocent face and addictive laughter, this garden statue will certainly bring a smile on everyone’s face. Pairing well with other similar statues, the garden elf by Bits and Pieces can find its place in the garden of a nursery or in the corner dedicated to your child’s playground. Who doesn’t love a fairy garden? I certainly do! And garden fairies stand among my favorite garden statues. From the dozens of models available on the market, one that stands out is the Garden Fairy with Glowing Cardinal by Moonrays. This decorative element boasts a double functionality and it can be used as both garden statue and garden light. The item is made of durable resin and hand painted in attractive colors. To protect the paint over time, the manufacturer applied a resistant coating over the paint. The light is powered by a rechargeable battery that uses solar light as a source of energy. Besides being an ecologic alternative to the garden lights powered by electricity, the functionality of this decorative element is also indefinite. The battery recharges during the day and it automatically turns on at twilight. While the beautiful cardinal bird glows in the dark, the fairy itself is delicate and beautiful, blending well in any corner of the garden. Pair it with matching statues to create a mystic and enchanted atmosphere. Cold cast ceramic is often used as a cheaper alternative to stone, aged cement, or even terracotta. Cold cast ceramic garden statues impress with their ageless look and they usually blend well in all decors and designs. Then, if you decide to choose a model of statue that matches literally all garden styles, then you will be able to change the look of your property as many times as you like. A cold cast ceramic statue that stands out is this Dragon Garden Statue by GetSet2Save. The statue impresses with its adorable face that matches well with a fairy garden but also with a more elegant environment. Ideal to place next to a pond or next to a patio border made of river stones, the sleeping garden will certainly become the center of attention in no time. Without a doubt, marble garden statues are the most attractive. Yet, not everyone can afford them. Nevertheless, if you want to benefit from the elegance of marble without worrying about your bank account, investing in a faux-marble statue might be a good idea. A beautiful statue to consider is the Serene Angel Garden Statue with Crackle Globe by Moonrays. Just as many other statues proposed by the manufacturer, the Serene Angel has a double functionality and it can be used as both a decorative element and garden light. The angel is made of resin and hand painted in white. The flawless finish resembles white marble while the price is more than approachable. Powered by solar light, the statue provides indefinite light and you will never have to worry about recharging the battery or turning on the lights. Pair it with other faux marble statues or place it in the middle of a flower bed to achieve an impressive result. A fairy garden is not all about fairies. Wildlife such as rabbits, squirrels, and deer are popular elements often used to enhance the fairytale atmosphere of the outdoor space. A statue to blend in your décor is the Curious Rabbit, a garden statue made of polyresin and stone. What strikes about this garden statue is the attention given to the details. The fur of the rabbit is modeled to perfection and the captivating brown eyes seem alive. This garden statue is perfect to match with a rustic or fairy garden. thanks to the rather reduced dimensions, it can also be placed anywhere indoors or outdoors. Lastly, the statue is made to last in time and boasts a protective coating that prevents colors from fading away. Finding the perfect garden statue is far from easy, especially when the budget is tight. Nevertheless, there are numerous inexpensive options that will still raise the curb appeal of your property thanks to their flawless designs. I hope these 10 garden statues ideas inspired you! Happy gardening!